Windows and Office maker Microsoft on Wednesday pushed a small but important update to OneDrive, its cloud storage client for the iPhone and iPad. The refreshed application enables users to lock content in the app using Touch ID-based fingerprint verification on the iPhone 5s, iPhone 6 and iPhone 6 Plus. The new OneDrive 4.5.1, a free 12.7-megabyte download from the App Store, also takes full advantage of the new iPhone 6 and iPhone 6 Plus, lets you sort files and folders and includes bug fixes and stability improvements. 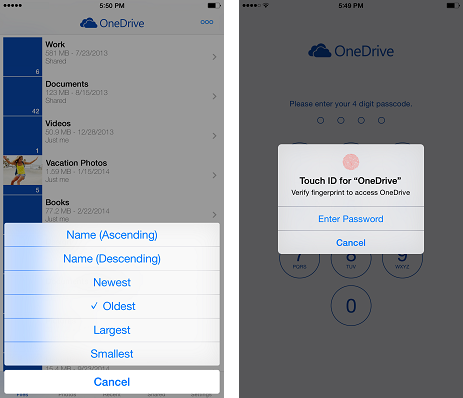 Leveraging Apple’s Touch ID framework in iOS 8 for third-party integration, OneDrive can be protected with fingerprint-based authentication to sign in to the app. And to help prevent others from accidentally making changes to your files, you can now set up a PIN code. And as seen on the screenshots top of post, OneDrive at last makes it possible to sort the files and folders on your device. Lastly (you guessed right), OneDrive will no longer appear fuzzy on the bigger iPhone 6 and iPhone 6 Plus screens as Microsoft has gotten around adjusting the software to make use of the extra screen real estate. In related app news, Pocket and PDF Expert 5 both gained native support for the new iPhone 6 and iPhone 6 Plus display sizes. OneDrive is available free in the App Store.